This bangle is a one-off piece, with the carving pattern designed and hand-made especially for this individual stone. The silver is finely hand-carved on the sides and back of the stone, in our signature Ozmomo setting. 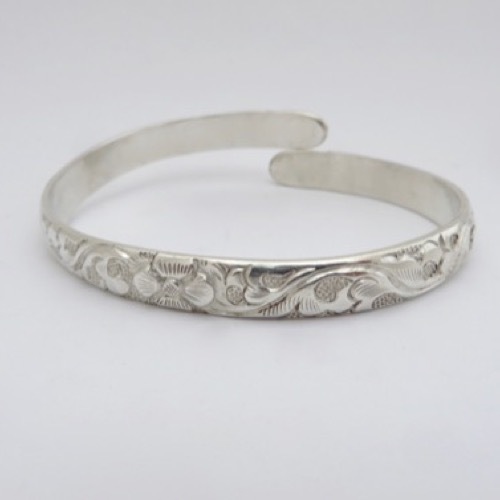 The band is solid silver and carved all around. Fasten the bangle with a hook on the band to a ring on the side of the stone. The bangle is secure on your wrist, with a groove to the side of the ring so that the hook has to be moved sideways to unclip. This bangle is very comfortable and hard-wearing, and fine to wear and enjoy in the water and in everyday life!